After 48 hours, the intensity of rains will start reducing and light to moderate rainfall will be experienced. Chennai: The trough of low over Southwest Bay of Bengal and neighbourhood resulted in rains since Monday night in Chennai, which had remained dry for some days and rains will now continue over Chennai and rest of Tamil Nadu for the next three days till December 7. After 48 hours, the intensity of rains will start reducing and light to moderate rainfall will be experienced. Heavy rains are likely to lash parts of coastal districts of TN in the next two days following a trough of low over Bay of Bengal, the regional weather office said on Tuesday. In the last 24 hours ended 8.30 am on Tuesday, there were widespread rains in many parts in coastal TN and neighbouring Puducherry. According to Deputy Director General of Meteorology, S. Balachandran the trough of low over Southwest Bay of Bengal and neighbourhood now runs from Comorin area to southwest Bay of Bengal off south Andhra Pradesh coast. “Due to this, there were widespread rains in the last 24 hours in the coastal areas of Tamil Nadu and Puducherry,” he told reporters here. As per the rainfall data at 8.30 am on Tuesday, Ponneri and Cholavaram in Tiruvallur district recorded 13 cm and 8 cm, respectively, followed by Kelambakkam (Kancheepuram district) at 7 cm. The regional weather office further forecast heavy rains in one or two places in the coastal districts of Tamil Nadu in the next two days, while light showers were likely in most places in the State and Puducherry. 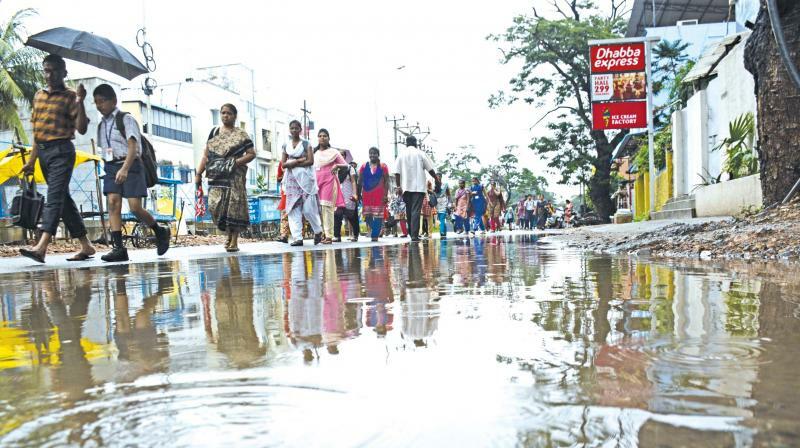 There would be intermittent showers in and around Chennai and the neighbourhood during this period, it said. According to skymetweather.com, during the last 24 hours, easterly wave has become active due to which coastal districts of Tamil Nadu including Chennai have received light to moderate rains with few heavy spells. In the last 24 hours from 8:30 am on Monday, Chennai's Meenambakkam recorded 46 mm rain, followed by Karaikal 45 mm, Parangepettai 33 mm, Nagapattinam 23 mm and Thondi 22.7 mm. "At present, a cyclonic circulation is persisting over South Interior Karnataka. Moreover, a trough is also seen running along the Tamil Nadu Coast. In wake of all these weather systems, we expect scattered light to moderate rains to continue over many parts of the State. Even though intensity of rains will start decreasing after 24 hours, but coverage area will increase. Good rains which was confined to coastal districts will now spread to entire Tamil Nadu. These on and off rains will continue till tomorrow i.e. December 5," skymetweather said. Thereafter, significant decrease will be observed, and weather will start clearing up. In fact, by December 7, rains are expected to stop and weather will become dry over most places. Vedic Astro-Meterologist S. Ramachandran in his annual weather forecast for 2018 (prepared during July, 2017), had forecast two cyclones before the year-end. Tamil Nadu will end up with excess rainfall in 2018, he says. "More widespread rainfall is forecast for the period between Nov. 27 and Dec. 31, 2018. During these period Southern districts of Tamil Nadu, Kerala will get more rainfall and moderate to heavy rainfall is forecast for Central Tamil Nadu. Severe flooding during this period is forecast," Mr. Ramachandran adds.